We are not only a dry cleaners, we offer a wide range of on-site services — Laundry, Ironing, Repairs/Alterations & Carpet/Rug Cleaning. 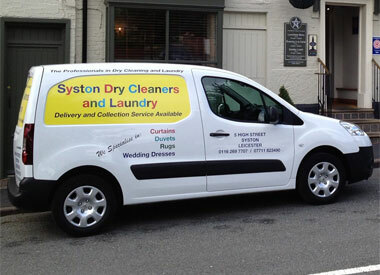 We offer free Delivery and Collection service within a 5 mile radius. Please select one of our services from the menu on the left for more information, or call us on 0116 269 7707, email us, or visit us to discuss your requirements.